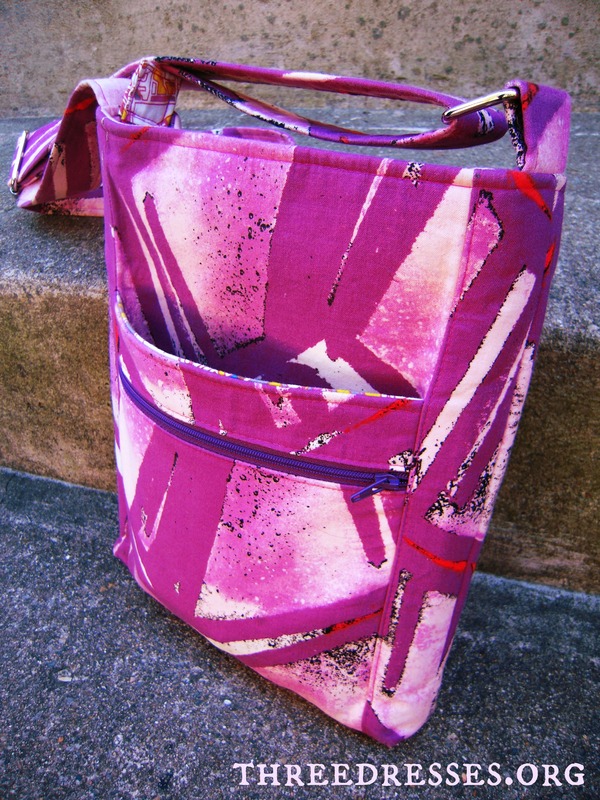 Diane commented on Bagmaking Blog Hop: Two Zip Hipster Review & Giveaway!I love this bag! The fabrics you used are perfect. Think I’ll have to get this pattern. Thanks for the chance to win. The comments will remain open but the giveaway is now closed. Should I not hear from the winner (I have emailed them), I’ll draw a new number. Thanks for entering!! Welcome to the last day of the Dog Under My Desk Bagmaking Blog Hop! I’m so excited to be part of this. I usually add a disclaimer when I’ve received a pattern in exchange for a review but I bought this and other of Erin’s patterns before this blog hop came up so there’s your grain of salt to read my review with. I’ve made over a dozen wristlets, a Daytripper and I’ve now made my second Two Zip Hipster- here’s a pic of my first Two Zip. I have been meaning to make another Two Zip Hipster every since I finished my first. It’s such an enjoyable pattern. I say this all the time about Erin’s patterns- you won’t be disappointed. Her patterns and instructions are so detailed that your first make will look very professional- it won’t look like your first. The insides of all her bags are fully lined and there’s no hand stitching- unless you feel like doing a slip stitch to close up the lining after turning the bag. Erin reminds you to press, which we all know is huge in getting something you make to look really nice and she doesn’t make you guess which way is the best way to do something- she just tells you. No guess work. I don’t make bags often so I appreciate all the guidance. Her instructions are very straightforward and more than complete. Erin has a lot of tips along the way, too, on how to get over multiple layers and she doesn’t assume you have an expensive sewing machine. Her instructions actually have you trim a lot of bulk down so a basic machine can sew it up. I did use my industrial sewing machine but that’s because Max loves making bags but my basic Necchi has handles making Erin’s bags just as easily. The only specialty foot I used on my bags with Max the Machine is a zipper foot. Max handles layers like they’re yesterday’s news so I have only used a walking foot with my Necchi. One thing you might want to do before you start on your second or third Two Zip Hipster is to make a cheat sheet since you will probably internalize Erin’s tips after you make your first bag. With a cheat sheet, you can just glance over at the steps and, if need be, peek at the full instructions. Oh and don’t forget to peruse the full set of instructions before you start your first bag. You’ll get a better lay of the land that way. 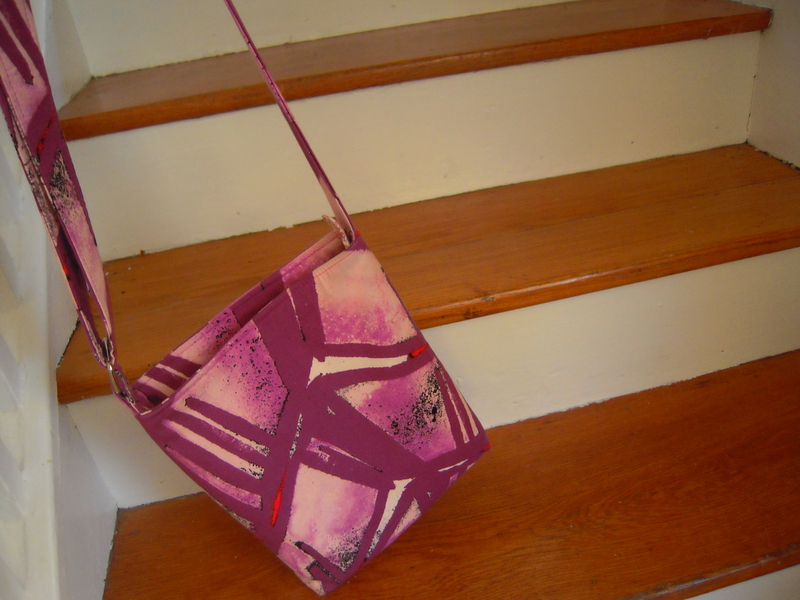 The Two Zip Hipster I made for the blog hop is made of two quilting cotton prints of Jay McCarroll’s Center City line. I love these prints. I bought them at Crimson Tate in town but you can find the outside print here and the lining print here. I love anything architectural and related to cultural geography. I like the different perspective. I took pictures inside and outside so you could see how the color of the bag changes in the light. Front zipper pocket. So handy! Front pocket where, yes, you will always find lipsticks and tape measures. Zipper tab in my lining fabric. Wanna see inside the main pocket? I added pen pockets and measured my cell phone so I would have a pocket that fits it perfectly. I also stitched a horizontal line the width of my cell so that it wouldn’t sink into the pocket. Instead, it fits perfectly with about 1″ peeking out of the pocket for easy handling. Don’t you just love the pink zipper and the inside lining! It’s a map of downtown L.A.
My Two Zip, aka Little McCarroll, loves to play birthday party. Look how he smiles. Hanging out in the window, next to the door to the garage. I use this bag every day. Little McCarroll chilling in a cushy chair. I think Little McCarroll is heading up for a nap. Now on to the giveaway! Comment on this post to enter to win a PDF copy of the Two Zip Hipster pattern. You can tell me what you think of this bag or tell me something random you have in your purse or bag. I will announce the winner on Saturday, September 28th at 7pm ET. This giveaway is open to all who can receive email. Yup, that’s it! Oh, wait. That’s not all. Erin will be doing a giveaway tomorrow on her blog. So, go on over and comment to win some bag making supplies. The link will also take you to a list of the other bloggers who participated in the blog hop. You should check out all the bags. They’re so awesome. I love this bag from the pattern to the fabric to the lining to the zipper. 🙂 It’s awesome! What a cute bag! I could see this being the perfect grab and go bag! Thanks. It really is a great grab and go bag. Perfect size! I love this pattern – I think it’s my favourite of Erin’s patterns! I love the LA map lining! I was looking for something similar for New York earlier this year to make a wedding anniversary present for my sister and brother-in-law (they honeymooned in New York), but alas I had to settle for a fabric featuring famous landmarks instead. This bag just looks so handy – the style reminds me of a bag that I carried EVERYWHERE when I was at university. I’d love to have something similar again. So practical! Your bags look awesome – I love the pen pockets. Thanks for the idea! I would love to win the pattern and give it a try. Thanks! yes please! he’s got an evil face on one side and a sad face on the other! love the fabrics. The pen pockets are very clever! Love it, love it !! That bag looks fabulous! I’m in love with the fabric you used, too. Something random in my bag is definitely the scraps of fabric I’m always shoving in there so I can match them to zippers and thread. I never remember to buy everything I need on my first trip to the fabric store! I love McCarrol’s fabric choices! He appears to be the kind of guy who likes to ” hang- out” where all the action is. No wonder he needs a nap! I don’t know why I haven’t attempted a bag making project. I really love them every time I see them. If I win the Two-Zip-Hip pattern, I won’t have an excuse not to get busy and start sewing! 😀 Really love project and thanks for the giveaway. I love this bag! The fabrics you used are perfect. Think I’ll have to get this pattern. Thanks for the chance to win. Erin has the best patterns and instructions ever. I’ve made the wristlets and would love to try this one. I neeeeeed this pattern 🙂 Your bag is lovely! cute bag! and holy cow, just this morning i was thinking how i could totally use a bag exactly like this. must be fate… thanks for the review! For some reason I have a bottle of nail polish and a bunch of vintage buttons in my purse! mmm! my favorite of her patterns! random object in my bag? i forgot to take a stinky diaper out the other day (it sat in there for two days) and now there’s a lingering odor in my bag. EWWW. Little McCarroll leads an interesting life! :^) Great bag. I don’t carry much in my purse — just the essentials: driver’s license, credit cards, lip balm, car keys, and lip balm. 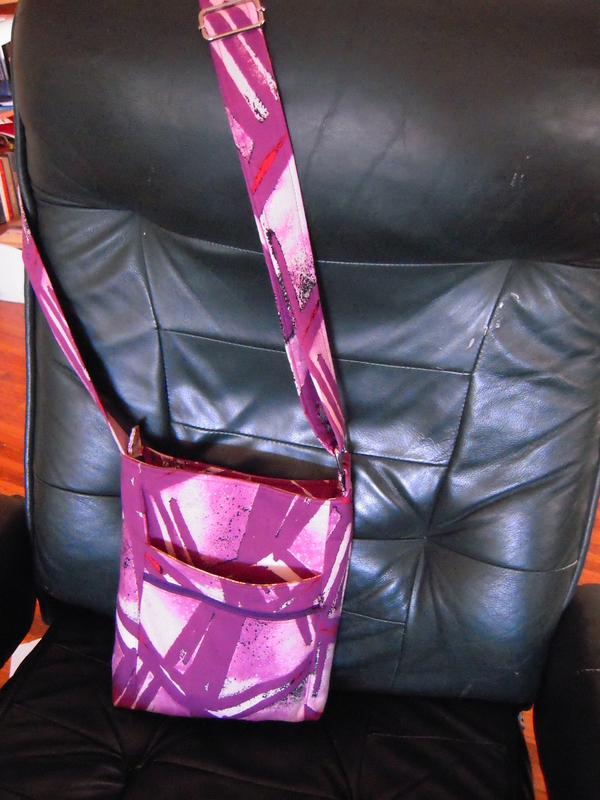 Ooh I love your bag but have yet to try one of Erin’s patterns… Random stuff in my bag depends on Boy! Today it was a playmobil caveman, a feather and an odd sock! 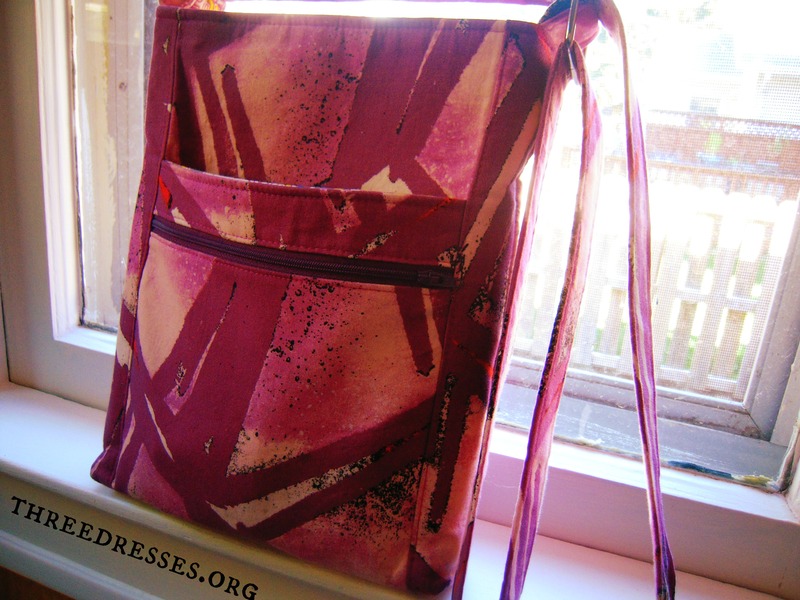 I made this bag and I love it and the detailed instructions! Oh I really want to make this bag! The lining fabric is awesome since my son is moving to LA in a few weeks! I love this bag. And I have two hips, so, you know, match made in … Bag End? A random thing I have in my bag right now is my bike light; I took it off whilst parked and haven’t needed to put it back on the bike yet. Your bag looks great and your post was very entertaining! I also carry a tape measure in my bag which seems perfectly normal to those of us that sew, but seems odd to other people. Sometimes when my husband and I are at the home improvement store he needs to borrow the tape measure (and my reading glasses!) since I always have those things and he never does. I don’t think he’d be willing to carry his own bag though. This is super fun fabric. Looks like a great bag. I carry lots of random stuff in my purse… but today I’ll settle for horses. I have been following Erin’s blog for a while and have been wanting to make this bag for a while. It would be amazing to win such a great pattern. I love the idea of a pocket that fits my phone perfectly!! This looks like a really handy bag. And I love the fabric you used. It actually has a devilish grin in some of the pictures! What a cute bag! I love the fabric patterns. I have Erin’s zip and go pattern, and I have found it very easy to follow along with her instructions. So far I have made 4 of the zip and go with plans for more. I hope to try the two zip hipster sometime soon. Your bag looks great. Thanks for the great reminder to customize pockets the way we need them. Erin has great patterns! I’m planning to make the Daytripper but would love to make a smaller bag as well. The Two Zip sounds perfect! Thanks! Hooray for cross body bags – I like them for vacations, they keep everything close, and still be big enough for my camera. Thanks for the give away! I love Erin’s patterns!! I have made her wristlets, and would really love to make this bag, too. I’ve been wanting to make a White Sox bag; a small easy to carry purse for going to see games-just enough to hold my phone, cash and sunglasses. This pattern would be perfect! Love your ideas! I love this bag! Whether I win the pattern or not, I plan on getting my hands on it and making it right away. I have been looking out for something exactly like it. Okay that bag is darn cute. I want the pattern! Thank you Leila! I’ve replied to your email. Let me know what info you need. Just emailed you the pattern. Have fun!